Every year, millions of people are bitten by animals and household pets, such as dogs. While the majority of these dog bites are minor, many are severe and leave lasting physical and emotional scars on victims of dog bite injuries. Personal injuries from dog bites make up for as many as a third of homeowners’ insurance claims across the country, and with an increasing number of people adopting dogs as family pets, the risk of dangerous interactions with animals will only increase as time goes on. At Cap & Kudler, we pride ourselves on expert representation across all areas of personal injury law. Even if a dog bit you out of fear or perceived self-defense, you may still be eligible to recover financial compensation from the dog’s owner in the event that you sustain a serious injury. What are Nevada’s Dog Bite Laws? Unlike many other states, Nevada does not have a statewide “dog bite statute” that dictates how dog bites are handled. The owner was in violation of a municipal statute regarding dog ownership, such as a failure to keep a dog leashed in public (negligence per se). Because there is no statewide legislation regarding how dog bite cases are handled in court, they are handled on a case-by-case basis using the above criteria as “guidelines” regarding the elements needed for a victim to prove her case against the dog owner or others. It is always the victim’s duty to prove that the owner had a duty to protect her and others like her, that the owner failed to do so and that the victim was injured as a result of that failure. This could be by proving that the owner of the dog was negligent or negligent per se by allowing a potentially dangerous dog to roam freely which resulted in the victim being bitten and injured. What About a Dog Bite that Occurs on While Trespassing? In some states, exceptions are made to owner liability if a dog bites an intruder or trespasser who is knowingly entering private property, whether or not there is knowledge of the presence of a dog. However, Nevada provides no such provisions—meaning that a dog owner can still be held liable in some circumstances even if the person bitten was a trespasser. The issue is whether or not it was reasonably foreseeable for the victim to have been injured by the dog. However, under the City and County Ordinances we have reviewed, a dog may be declared “vicious” or “dangerous” in the proceedings of a normal dog bite case, but dog cannot be declared as such if defending the owner’s property from a trespasser or against someone who was unlawfully provoking it. Dog bite claims related to trespassing or provoking incidents can be a bit confusing to navigate, which is why retaining an experienced dog bite attorney is highly recommended in these instances. According to the Center for Disease Control and Prevention (CDC), approximately 4.5 million people are bitten by dogs each year, with over half of these occurring at home with familiar dogs. Because of this, it should never be assumed that a dog cannot and will not bite you—even the friendliest dog may snap if it feels threatened or anxious. Nearly 1 in 5 people who are bitten by dogs will require medical attention following injury, and this can become a costly and traumatic experience to those who have suffered a dog bite—especially from a familiar dog. Always asking if it is okay to pet someone else’s dog before reaching out to pet the dog. When approached by an unfamiliar dog, remaining motionless. If a dog knocks you over, curling into a ball with your head tucked and your hands over your ears and neck. Immediately letting an adult know about any stray dogs or dogs that are behaving strangely. Not approaching an unfamiliar dog. Not running from a dog. Not panicking or making loud noises. Not disturbing a dog that is sleeping, eating, or caring for puppies. Not petting a dog without allowing it to see and sniff you first. Not encouraging your dog to play aggressively. Not letting small children play with a dog unsupervised. The first (and most important) thing to do after being bitten by a dog is to treat any injury sustained. In the case of severe wounds, this may warrant a trip to the hospital to receive medical treatment such as stitches or splints. Once the dog bite wound has been sufficiently treated, the next thing is to report dog bite to the city or county Health Officer or Animal Control Officer and to provide all information required by them. This is a legal duty to all citizens of Clark County, and must be done by both the owner and the bite recipient as well. Retaining the help of an experienced dog bite attorney should be your next priority, as they will be the party primarily responsible for all legal aspects of your claim. We will handle your insurance claims, any issues arising from the defendant’s own legal team, and allow you to focus on what is most important following such a traumatic episode—rest and recovery. Being injured by a dog bite can be a traumatic ordeal for every party involved. Dog owners and their legal team will often attempt do everything in their power to paint you as the responsible one, potentially leaving you in a situation where you receive no compensation for the injuries you sustained, as well as letting a possibly dangerous dog potentially injure more victims in the future. To prevent this from happening, you’ll need a competent legal team of your own. 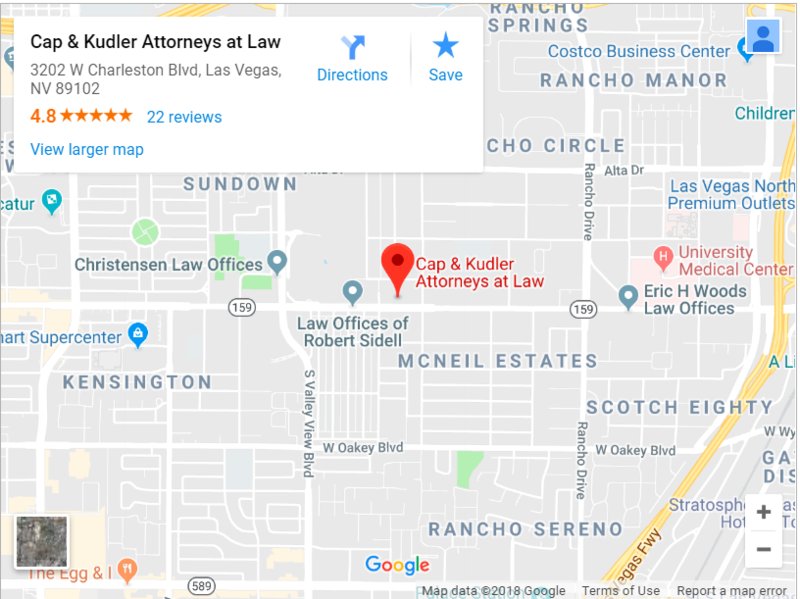 At Cap & Kudler, we are happy to offer legal assistance to dog bite victims with any questions or concerns they may have regarding the claim filing process—as well as how best to prove full liability on the owner’s part—in order to ensure that they can recover compensation for their injuries. If you or a loved one has been injured from a dog bite and wish to know more about filing a dog bite claim, contact us today to discuss the details of your case.